When it comes to buying your bridal lehenga, the thing that you tend to wonder the most is the lehenga colour combination. 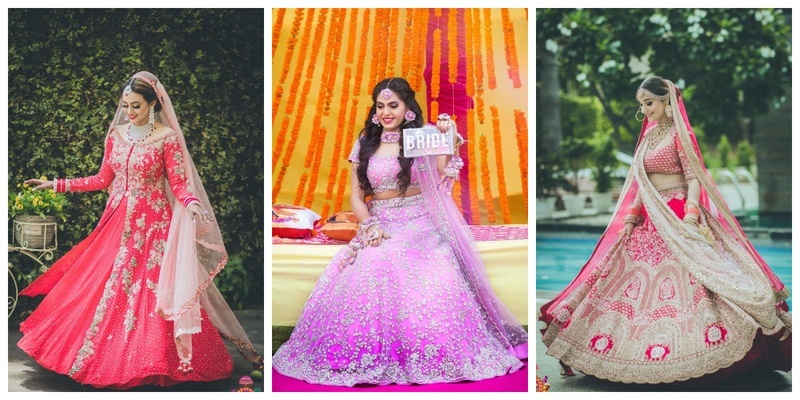 Finding the perfect lehenga colour that matches your personal style, the decor of your wedding event and even your hubby’s outfit is pretty stressful, to say the least. To give you an idea of what the trending lehenga colours of 2018 are, I have curated a list of top 15 lehenga colour combinations that you will absolutely love! Scroll on, and save the lehenga colours you love so that you know exactly what you want to wear on your wedding as well as pre-wedding events. While bright gold and red lehenga is a common lehenga colour combination, you can try something hatke by incorporating a powdery gold embroidery on your red wedding lehenga. Sea green and shades of pink is the latest colour combination for lehenga, especially for the ones that are designed to be worn for daytime functions like the mehendi ceremony. Doesn’t this lehenga with pink floral print and choli in embroidered sea green colour look absolutely stunning? This beautiful paradise pink lehenga combined with a ivory choli and gold embroidery detailing makes for a stunning lehenga colour combination. A bright and peppy lehenga colour combination, this beautiful blend of orange and hot pink makes for the perfect mehendi outfit. A pinkish-red lehenga with silver-green floral embroidery and starry accents all over! What’s not to love in this lehenga colour combination? This ruby red lehenga with gold and copper accented embroidery is a traditional yet pretty looking lehenga colour to wear on your big day. Let’s admit it that emerald green is a royal colour and makes any bride look like a total diva. But when it comes to finding a colour combination for emerald green, this sea green and gold embroidery takes the cake. It makes the lehenga colour look refreshing and royal at the same time! Instagram influencer Diipa Khosla wore this beautiful Anamika Khanna lehenga on her sangeet. Totally loving the lehenga colour combination of champagne gold with silver and peach accented embroidery. BTW, Diipa wore some really amazing outfits for her wedding, you can check them out here! This purple and silver lehenga colour combination is fresh and fascinating. It is just the perfect outfit to wear during a daytime mehendi ceremony. Rest assured, it will add a whole pop of colour to the entire event. This royal blue and grey lehenga colour combination is stunning for an evening reception held during the fall-winter months. The pop of blue accented with the ashy grey colour sure makes for an unconventional bridal statement. Doesn’t this bride look absolutely gorgeous wearing an ivory lehenga with multicolour lotus prints and a hot pink Banarasi silk dupatta? This beautiful blush pink ombre lehenga colour with chrome gold buttis, gota patti choli and net dupatta is just perfect to wear on your wedding day! If you are fond of light and pastel colours then this lehenga colour combination of 2018 will totally catch your fancy. The beautiful contrast of sea green and baby pink makes for a gorgeous lehenga design for a daytime spring wedding! Featuring a subtle colour combination of grey-green with pink and olive accents, this lehenga colour is perfect for the bride who prefers minimalism over going all out on her big day. Red is undoubtedly the most popular colour for bridal lehengas. But what can make it stand out is multicolour floral embroidery and a colour combination of sea green. Plus, the netted sea green dupatta with gold detailing, uff! Which one of the lehenga colour combinations did you find the most interesting to wear on your big day?